For a change, the Vizhinjam project has been getting the sort of attention that a Rs 6000 Crore mega-infrastructure project, which can change the face of Kerala, should be getting. After the heartening progress made with the ongoing bid process, it has been embroiled in the controversy of whether it would or would not receive environmental clearance. The recent visit to Trivandrum by Jairam Ramesh seems to have added some impetus to the project's chances of getting a green flag sooner rather than later. Despite the fact that the whole drama reeks of being staged for the benefit of the current Congress-led Government, it is to be hoped that Mr Ramesh's promise of a speedy and positive conclusion to the whole debate will be honored. Especially, in light of the fact that ports like Tata's Dhamra project in Orissa, which is in close proximity to a national park, sailed clean through with the proper mitigation measures in place. So is the Vizhinjam deep water port going to irreparably destroy our environment? Of course, not. Firstly, the project does not lie in an ecologically sensitive area, there are no mangrove forests or coral reefs anywhere in sight! There are no endangered species at risk from the construction of the port. Vizhinjam lies in a category of the Coastal Regulation/Management Zone that is well below the most sensitive type. Secondly, the only environment-related response of the Environmental Clearance committee meetings that considered the project is about the question of coastal erosion. The Trivandrum coast has its share of seasonal erosion and deposition and perhaps the Committee is concerned that the massive breakwater would alter the sediment flow patterns and cause accelerated erosion in nearby areas. While this is not totally implausible, the studies conducted by top-flight agencies such as Ramboll, not to mention the simulation tests run at the wave-pool in CET years ago are clear pointers to the fact that the minimal littoral drift along the project site would not result in any massive erosional effect. Moreover, when the final design of the breakwater is done, it would incorporate sophisticated modeling techniques to ensure that adverse hydrological impacts are minimized or mitigated. This is an issue that is associated with any major marine structure, not just ports, and is not a cause for extreme concern in view of the relative benign nature of the surroundings of the project. The other points raised by the latest EC Committee look far less scientific and more politically motivated in nature. For example, they have expressed concern about other container terminals in South India and how they would be affected by the development of Vizhinjam. For some weird reason, they even mentioned Colachel, where there is currently not even a proposal far less a concrete plan and a bid process in progress! This time, VISL - the project's nodal agency - was asked to submit an overall study of India's container sector. It seems odd that an EC discussion should focus so closely on techno-financial viability when the same EC didn't balk at sanctioning nearly a dozen major port projects just along the coast of Gujarat or gave the green flag for the Gangavaram port project just a few kilometers from the sprawling Vizag port! For an economy growing at 8 to 10% annually, which is now has the third largest GDP (in PPP terms) and which does not have even a single deep water container transshipment terminal till date, I fail to see where the question of viability or necessity lies. That said, some of the points raised in the Terms of Reference such as marine traffic study, construction methodology and site connectivity seem to be genuine, and seem to point towards a surprising lack of completeness of the EIA submitted by VISL. Either the latter and its consultants are totally incompetent, which is hard to believe considering the consultants include global majors such as the IFC and Royal-Haskoning, or there is some sort of smoke-and-mirrors act in progress to slow down the port's development. I believe that the project will eventually get its EIA approved. The only question is how long it will take. Hopefully, a provisional clearance can be issued with a revised application using available data, which would allow for construction to begin under carefully monitored conditions such as air and water quality, coastal erosion and so on. This is not an extraordinary practice for major projects and will allow preliminary work to begin before the results of the three season study come in (sometime in mid-2012). Without some sort of environmental nod, the current bid process is unlikely to get far and it seems the bankers are also unwilling to invest money, without such a green flag, in the Government's bid to construct the basic infrastructure. The Good news is that the new Government is persisting with the "landlord" model of development for the project and has just awarded the Project Management Consultancy to global construction giant, AECOM. But what is this model all about? In a nutshell, this means that the Government builds and owns the basic infrastructure of the port and then leases it out to one or more operators who bring in what is called the superstructure elements - cranes and other cargo handling equipment - and operates the berths, with a share of the revenue/lease rentals accruing to the Government. This has the obvious advantages of ensuring the construction of the port itself, complete control for the State over the asset and creating confidence for investors in a greenfield project, when compared to the previously touted Build-Operate-Transfer model which would have transferred the entire burden and risk on to the private developer-operator. The Government's getting ready to invest as much as Rs 2500 Crores ($ 600 Mn) into the Phase I infrastructure, drawing on funding from a consortium of bank led by local financial giant, State Bank of Travancore (fitting indeed!). Sounds hunky dory, doesn't it? As with anything, there are a few downsides too. When we let the Government design anything, the result typically is the most conservative and boring option possible. One major concern about the landlord model is that the Government will fail to maximize the use of India's deepest port by being conservative about its capabilities and the volume of the investment. For example, the current traffic projects are unbelievably low. If we believe what the Government has to say, Vizhinjam would see a traffic of 2.8 Million TEUs in 2030, less than what JNPT is seeing today and probably less than 3% of India's total traffic at that time. Not very bullish for the deepest and best located container transshipment terminal, is it? Especially in view of L&T Ramboll's projection of 5.5 Million TEUs during the last bid process. So either there is something wrong the fundamental logical assumption that India's deepest port, located closest to the main container routes would attract the lion's share of Indian cargo traffic or the Government is selling the project very very short. This means that the project looks much less attractive to an investor than it really is, and this would adversely impact its chances of attracting a good bid from a leading operator. Furthermore, while the current project proposal considers options such as a cruise terminal and general cargo over and above pure container traffic, there are many more options out there, as we will shortly talk about. Secondly, the landlord model, by design, transfers a lot of the project risk from the private sector to the public sector, in this classic case of Public Private Partnership (PPP). This is beneficial in making a risky, greenfield project more attractive. However, too much of a good thing could be bad. Once more, the Government needs to avoid selling itself short. An alternative would be for VISL to underwrite the cost of developing the basic infrastructure but base the bid on how much of the cost the private operator is willing to share. This will help to minimize the burden on the Treasury (creaky as it is!) and also ensure that the private player has as much skin in the game as possible and is therefore as motivated as possible to hard-sell the port and attract as much traffic as possible. The way that the Government is pushing ahead with the Engineering Procurement Construction (EPC) contract for the basic infrastructure, I hope that they will include sufficient flexibility in the design to meet the needs of the operator's plans. In the end, it will probably mean that either the EPC tender waits till the operator on board, which could take six months to a year, or that the construction starts with the operating area left as a blank slate. The ideal scenario - conditional environmental clearance would be granted in a month or two, the operator bid goes ahead and the EPC tender is handed out in consultation with the operator in about six months from now. So when we talk about infrastructure, connectivity and superstructure, what are we talking about? Okay, here we go into Port Construction 101! The basic constituents of a major port project include the breakwater, berths, backup area and connectivity. In the artist's impression above of the Vizhinjam port, the breakwater is the "J" shaped wall along the periphery of the port and stretching out into the sea. The berths are the "L" shaped area where the ships actually dock and include the cranes which handle containers and other cargo. The back-up area includes most of the rest of the port area, typically where cargo is stored. Connectivity refers to the road and rail connections which allow cargo to be brought in and taken out. The breakwater at Vizhinjam would be a massive structure stretching between 3 and 5 Km and located in up to 20 m of water depth. It seems that Vizhinjam would use a design based on massive boulders, quarried from somewhere close by - possibly near Attingal. The breakwater shelters the port's operating area, also called the basin, from the vagaries of the sea. This sheltered area allows ships to dock in all kinds of weather conditions, ranging from the placid calm to a raging cyclone. The berths are constructed by driving pilings into the sea and either filling the area behind with silt dredged from the sea or soil excavated from land, or using a concrete structure. Ships dock alongside the berths and they also support the cargo handling equipment - also called the port's superstructure - which includes quay cranes to handle containers, general purpose cranes and material handlers to work with bulk cargo. The backup area is usually created by leveling existing land or by reclaiming area from the sea as in the case of Vizhinjam. It's usually used to store cargo - container, bulk materials, cars, liquid cargo and so on. Vizhinjam would involve the reclamation of over 400 acres from the sea for the berths and back-up areas, in effect expanding the State of Kerala! This avoids costly and troublesome land acquisition. Vizhinjam will be connected to the rail and road network via dedicated links that will feed into the National Highway 47 and the main line railway from Trivandrum to Nagercoil. Survey work for this has already been completed and work is already in progress for the road connections. All told, the deep water port will have between 3 and 6 Km of berths (if the breakwater is also utilized), allowing for up to 12 of the world's longest ships to comfortably dock. The container berths themselves could be 2 to 3 Km long, capable of handling 6 ships the size of the reigning behemoths of the seas, the Emma Maersk class, at the same time. As some of us may recall, Vizhinjam started out as a general purpose port. This had its drawbacks when faced with the lack of cargo from Kerala, which is a minimally industrialized State (the port at Ernakulam gets most of its cargo from neighboring States). Next it evolved into a general purpose with a coal fired power plant attached to it, with the idea being to use the port to import the coal for the plant, as in the case of Ennore Port or the upcoming Ultra Mega Power Plants at Mundra and Krishnapatanam. Unfortunately, no one pursued this proposal to its conclusion, in which case we may have had the first energy port in India. In the 2000s, as the concept of containerization caught on globally, the need for deep water transshipment terminals to facilitate movement of cargo to and from India's relatively shallow major ports became evident with the success of Colombo and Singapore as very obvious indicators. Vizhinjam metamorphosized into a transshipment terminal with its location 10 nautical miles from the strategic Suze/Gulf - Malacca shipping lane and its inherent depth of 18 m making it an unbeatable proposition. Finally, in the latest round of bidding, the project consultant recommended making the port multi-purpose once more with the container terminal as an anchor use, thus introducing more flexibility into the project and reducing market risk. Today's economic scenario lays open a variety of uses in front of Vizhinjam. The container transshipment is a no-brainer. The rapidly expanding Indian economy is going to radically ramp up import-export volumes in the coming years and a large portion of this will be containerized. India's container traffic is expected to hit about 21 Million TEUs by 2015 (by when Phase I of Vizhinjam is expected to be operational). China's container traffic is up around 100 Million TEUs already and at India's current trade growth rates, we can confidently expect India's container traffic to be up around 100 Million TEUs by 2025 or so. There is absolutely no reason to expect that Vizhinjam which has strategic advantages over any other Indian port will not capture at least 10% of this volume through transshipment. While the deep water ports in Gujarat and those along the East Coast such as Gangavaram and Dhamra would be able to directly handle large main-line container ships (of capacity >8000 TEUs, 14 m draft), most existing major ports like JNPT, Mangalore, Ernakulam and Chennai would not be able to increase their existing drafts beyond the 12 to 14 m mark. This means that transshipment is unavoidable for these ports in order to remain competitive in view of the move by shipping lines to deploy larger and larger ships on the Asia to Europe/US routes to achieve economies of scale. This will allow Vizhinjam to tap into the traffic generated by the industrial areas in the peninsula. For starters, a deep water terminal at Vizhinjam would be able to give Colombo, the current regional transshipment hub, a real run for its money. Vizhinjam has the advantages of greater natural depth, proximity to the feeder ports (the transit between the hub and feeder ports is usually the most extensive on a per-kilometer basis) and the simplicity/security of being on Indian soil. If it is able to offer competitive tariffs (in my opinion, the Indian Government should offer subsidies to allow Vizhinjam to offer competitive rates in the National interest), there is no reason that Vizhinjam should not capture a major share of the traffic that currently flows via Colombo. Eventually, container volumes through the port should climb well past the 5 Million TEUs per year. Another clear possibility is cruise traffic, an area that the current project proposal seem to address. India's fast becoming a major cruise destination in the Indian Ocean region with nearly 100 cruise ships calling at Indian ports like the ones at Ernakulam, Goa and Mangalore last year. The major shipping lanes across the Indian Ocean see over 300 cruise ships pass through and with the excitement over India as a tourist destination, it is not surprising that many ships are now making stops in Indian ports to allow their passengers to glimpse the wonders of our country. Vizhinjam lies closer to these shipping lanes than any other port in India, which allows the massive cruise liners to sample India with the least expense and within the least time. Moreover, Trivandrum is one of the biggest destinations for foreign tourists in India and with an international airport within 15 Kilometers of the port, tourists can fly to any part of India and then later re-join their ship at its next port of call (usually Singapore or Dubai), a type of cruise activity called cruise-fly-cruise.Ports which have cruise ships just passing through typically do not make much money because neither the ships nor the tourists stay long enough spend much other than on short tours and trinkets. The real money lies in becoming the home port for cruise ships, just like Miami, Singapore, Hong Kong or Barcelona. Other Indian ports including Mumbai and Ernakulam have tried this without success, but the fact that Vizhinjam's location in the middle of the Indian Ocean could allow ships based there to sail to a number of attractive locations such as Goa, Lakshadweep, Mauritius, Maladives, Sri Lanka and the Seychelles. Even with ships just calling at Vizhinjam, the multiplier effect on the tourism industry in Kerala that has been wilting under the effect of the recession would be justification enough for the Government to invest money in building a adequately equipped cruise terminal, rather than on grandiose schemes that some other Indian ports have been dreaming up. The Indian Government has been looking for a couple of sites, one each on the West and East Coasts, for a world-class shipyard in an effort to boost India's presence in the global ship building and repair industry, which has come to be predominantly based in East Asia - China, South Korea and Japan. Poovar, a few Kilometers down the coast from Vizhinjam, has been proposed as a site and has gained a lot of support.The natural draft along the coast together with the proximity to a deep water port, as well as the presence of the international shipping lanes, make the Poovar site a clear winner but unfortunately the proposal has made no headway. The fact that neither the State Government nor the State's MPs seem to realize that this could be a multi-billion dollar investment doesn't help expedite the process. The port project itself could devote berth length to a ship repair facility, if not a true shipyard. This could be situated at one end of the port basin or along the breakwater. 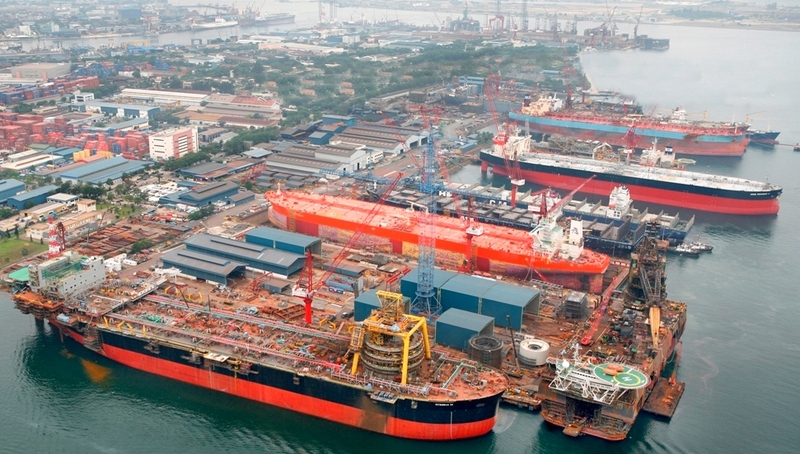 The yards at Singapore and Dubai find the majority of their thriving business due to their proximity to the shipping lane because ship owners tend to get their vessels repaired when they return empty after delivering cargo and at yard that require minimum deviation from the usual routes. Like Dubai and Singapore, Vizhinjam lies on these routes which account for about 1/3rd of the world's shipping trade, unlike major shipyards in Gujarat which lie about 3 days sailing distance away. An Indian shipyard also has the advantage of access to a more economical workforce and the massive production capacity of the Indian steel and engineering industries. A world-class ship building facility at Vizhinjam and Poovar, along the lines of the Dubai Maritime City, could finally put India on the world marine engineering map. In the 1990s, Vizhinjam was envisaged as an energy port, one that would import coal and use it to fuel a thermal power plant. There is no reason to think otherwise now, in fact the idea makes more sense now than at any other time in the past. India plans to add over 100,000 MW of power generation capacity in the next 10 years, of which the vast majority would be coal-fired. Recent reports point to the fact that India's biggest coal producer, Coal India Limited, is going to fall far short of the demand for thermal coal as more and more power plants come online to feed the needs of India's rising giant of an economy. Moreover, Indian coal tends to be lower in energy value and more polluting that global supplies, such as those found in Australia. All of this means that a massive volume of coal imports is unavoidable into the foreseeable future. Most of this will come by sea from Australia and Indonesia. As in the case of any cargo, and more so in the case of other bulk cargo such as crude oil, coal transport sees major economies of scale - bigger ships have lower transport costs - per ton per kilometer. At present only a handful of ports like Mundra, Gangavaram and Dhamra can handle the largest coal carriers, behemoths that can carry over 200,000 tons of coal and need operating drafts of over 18 m. This is the prime reason for locating most of the giant Ultra Mega Power Projects near these ports, as each needs over 20 Million tons of coal a year. Kerala has not laid claim to one of these massive power stations but it can easily ask for one to be built somewhere in Trivandrum district, where large tracts of Government-owned land are available in the Eastern parts of the district. These UMPPs use super-critical boiler technology which minimizes pollution and produces power at low tariffs (of the order of Rs 2/unit) which is comparable to that of hydro-power. A single UMPP could not only solve Kerala's energy needs for the foreseeable future, it could export half its power to other States. If land is a major constraint, the UMPP could be built in partnership with Tamilnadu which could host the power station itself in its Kanyakumari or Tirunelveli districts (which have tens of thousands of acres of available land), with the coal being off-loaded at Vizhinjam and moved to the station by rail or long distance conveyor belt. The deep water port could also provide a facility for coal transshipment, which is analogous to container transshipment, and involves transferring coal from giant dry bulk carriers to smaller ships which can deliver to shallower, existing ports. Vizhinjam is also the only port in India and one of the very few in the world which can accommodate Very/Ultra Large Crude Carriers at a berth. Other Indian ports have to make do by handling these giants with drafts of over 22 m at Single Point Moorings (SPM) located out at sea. For example, the refinery at Ernakulam has to use a SPM located nearly 20 Km from shore, whereas these supertankers could actually come into Vizhinjam fully loaded. This opens the possibility of having a new refinery built in or close to Trivandrum, one which could be export oriented, like the Reliance unit at Jamnagar which imports crude and exports the refined products. In short, the deep water port can lead investments of over Rs 30,000 Crores ($ 7 Billion) if the State Government plays its cards right. Whereas once wars were fought over the control of the Aegean, the Atlantic and the Pacific, today the world's centers of maritime tension are in Asia - the Persian Gulf, the South China Sea and the Indian Ocean. The latter not only adjoins all of South and South-East Asia but East Africa and the Middle East. Almost every single barrel of the Persian Gulf's crude oil supplies passes through the Indian Ocean on its way to India, China, Japan, Europe and the US. So does the vast majority of the Asia - Europe trade and almost all of China and Japan's imports. Just how important this trade artery has become was exposed by how a few half-naked pirates were able to grab international headlines and result in the deployment of an international naval fleet seldom seen since World War II. China has been following a "string of pearls" policy to extend its maritime influence over crucial trade routes by locating naval bases in countries along these routes. Bases have come up in Myanmar and recently in Sri Lanka, where China has just completed a deep water port at Hambantota. Recently, the Wall Street Journal and other media agencies had reported the Chinese take-over of Pakistan's deep water port at Gwador. This means that not only does China have significant secure access to the vital Indian Ocean but the Chinese Navy now has potential bases close to both the vital trade routes and Indian soil. Not to sound alarmist, but the situation is akin to the 1962 stand off between the two Superpowers, that we now call the Cuban Missile Crisis (refer X-Men: First Class!). Vizhinjam offers the Indian Navy its best possible location for a strategic base that can dominate the northern Indian Ocean and every major shipping lane passing close to India. Next to the US base at Diego Garcia, Vizhinjam offers the ideal location for a long range naval base for the Indian Navy to control the Indian Ocean. The other option is in the Andaman Islands but a mainland base would probably be more preferable. With its deep draft and the protection afforded by the Southern Air Command (SAC) fighter bases at Trivandrum, Sulur, Thirunelveli and Tanjore, the port could be a great location to deploy the Navy's new flagship, the INS Vikramaditya. Even if we are not tangling with the People's Navy (which is moving ahead with its own aircraft carrier program), long range patrol vessels located at Vizhinjam would be able to interdict any pirate threats to the shipping lanes. Indeed, the major expansion of the Coast Guard presence at Vizhinjam is a sure sign of this as are the shifting of the IAF's Maritime Operations Center to Trivandrum and the annual Dakshin Prahar exercises. The fact that SAC is being beefed up with three new fighter bases and the ongoing acquisition of both long range maritime patrol aircraft and strike aircraft like the SU-30 and the new Multi-Role Combat Aircraft is yet another sign that India is taking its Indian Ocean role very, very seriously. The Indian Navy has already asked for space to berth its ships at Vizhinjam and I would not be surprised to say a couple of missile frigates and a carrier docked in the port in the near future. In short, the port's importance as a strategic security asset is as clear as its importance as a strategic economic asset and it won't be very surprising if A.K. Antony is one of the staunchest behind-the-scenes supporters of the project! In short, India's deepest port is far from being a simple commercial proposition. It's potential is only limited by the imagination and ambition of the Government, and it's to be hoped that the approach adopted in the coming month is not the conventional tame one but an audacious proposal which seeks to harness all the obvious advantages of Vizhinjam and transform Southern Kerala into a world-class economic powerhouse. Ideally, I would like to see the port start off with a total berth length of atleast 3 Km in Phase I with 1.5 Km devoted to container transshipment, a 300 m berth for the Indian Navy, a basic cruise terminal and the beginnings of a world-class ship repair facility in the remaining area. Simultaneously, Kerala can make a bid for a UMPP which would use Vizhinjam to import its fuel and this can form the lynch pin of Phase II that starts by around 2015, together with a doubling of the container handling capacity. From there, it all depends on the economics but I would not be surprised if the port finally ends up accommodating a greater density and diversity of uses than we discussed here. It all depends on how the first few steps - the bid, the clearances and the initial development work - fare and fingers crossed on that! Excellent write Ajay. The article did summarise all aspects of the recent happenings at Vizhinjam and port engineering in general. I would like to supplement a few thoughts as well. • Coastal Erosion - Yes, as you mentioned the coastal erosion is not a serious issue that ports have not been facing in the past. Quite a few numbers of engineering solutions have been implemented globally to minimise the effect of new structures at sea. Of all of these techniques, the most environmental friendly and innovative method was dared to be implemented by Port of Rotterdam in their Maasvlakte 2 project. The project is constructing 6kms of artificial beach / sand dune with planted grass, on the seaward side of the breakwater to minimise the littoral drift effects and to maintain the more tranquil condition at the port entrance. Hence let us hope that all necessary studies are done by the EPC contractor and the master planner prior to the infrastructure construction activities. Hopefully AECOM / Haskoning detail a more stringent design methodology while preparing the bids for EPC contractor. • Proximity to other ports - The development of other ports in the vicinity will be proving better in long term on a national port planning point of view. There will be a good pie for everyone as the container traffic has been witnessing an exponential growth over the last decade and this is expected to grow. The south-west coast of India can thus emerge as a large hub of maritime business with Vallarpadam and Vizhinjam or maybe even Colachel. Thus a deepwater port of the scale of Vizhinjam is imperative at this stage for India’s economy. • Landlord Model – The landlord model has been seen successful in most of the major ports across the world. Regarding the downsides as you mentioned, the trend maybe, in the initial phase to come up with a more conservative and boring option. But once the first container terminal can bring in revenues and impart confidence to the government, and then more innovative methods can be asked for the subsequent phases of development. Moreover, the subsequent phases will bring in a second or third developer/operator of the terminal thus bringing in a healthy competition between two terminals inside the same port. This model has been running successfully in Hong Kong, Rotterdam and Laem Chabang in Thailand. Singapore also has a similar model with Maritime Port Authority owning the land and Port of Singapore Authority acting as operators. Eventually both are controlled by government though. Earlier as stated by VISL, the developer will have the conditional right of first refusal for the EPC contract. Hence let us hope that the team can be work together in bringing out the best option for the infrastructure facility as well. The concern at this moment is how much thoughts are put into the expansion options of Vizhinjam terminal to enable it to grow in the coming years. Hope AECOM and Haskoning cover up these items as well. • Port facilities – Further to the port facilities as mentioned, the following might also needs to be addressed by VISL sooner. • Finally, the annual throughput of 2.3Mn TEU’s as predicted by Drewry/IFC is definitely too low as Vizhinjam is concerned. Hopefully in the coming years, it is proven wrong and let Trivandrum emerge as a major maritime destination in South Asia. I feel that the history of 'Planning Vizhinjam port' should have been detailed. It would have given an idea of those forces who are against this project. My fear is that this project will not be functional anytime soon. Ajay, it's really a nice one. Let the authorities open their eyes and implement Vizhinjam, rather putting hurdles based on reasons unknown to all. What about the waterway [for country barges and houseboats] from the Airport to the rest of the State, proposed by VN Chandran, former Director of TVM Airport, and said to be approved by the LDF government? Ajay, you know we can't allow this project as 4 or 5 fishermen might have to be relocated. Perhaps if they were compensated on the order of 1 crore each (some for them, some for the politicians), something might happen..
that a very well written article , i have been following your blog for a long time, i think this is the most detailed article you have put in the recent times , anyway hope things work out the way its projected .keep posting in more and let the good works continue.